Give your students a strong foundation and build their interest in science with the Structures program. The program, led by Museum interpreters, is designed to support Grade 3 Science curriculum outcomes for the Materials and Structures unit. 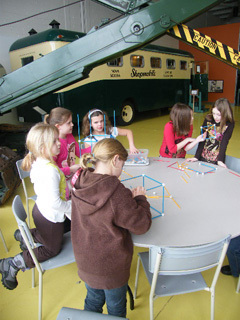 During the program, students engage in activities that explore how shape, and the forces of compression, tension and gravity act on structures. Students then put theory to the test by building their own structures in small groups, using Zomes® construction components. The challenge: to work as a team and build the tallest structure that will stand up on its own, with the time and resources provided. Outcome 3: Students will construct a structure safely to meet certain established criteria. Students are introduced to how shapes, and the forces of tension and compression, are used to strengthen structures and overcome the force of gravity.